A long time ago in Tondonao, there lived a great hunter. His name was Sigarlaki. He was very skillful with his spear. He used his spear to hunt animals in the jungle. He was a very famous hunter. Every time he hunts in the jungle, he always went home with some animals. Sigarlaki had a servant. His name was Limbat. Sigarlaki was very lucky; Limbat had been always loyal to him. Everywhere Sigarlaki went hunting, Limbat was always next to him. As always, in one beautiful morning, Sigarlaki and Limbat went to the jungle to hunt some animals. Sigarlaki prepared his great weapon, the spear. But, today was not his lucky day. They have looked for animals for several hours. For the first time in his life, Sigarlaki was not able to bring home an animal. Sigarlaki became angrier when Limbat told him that their food at home was stolen. Sigarlaki accused Limbat stealing the food. Limbat was sad. He never thought that his master would accuse him as a thief. Then Sigarlaki asked Limbat to prove that he is innocent. Sigarlaki would throw his spear to a big pond. At the same time, Limbat had to jump also to the big pond. If the spear would come out from the water earlier than Limbat, it meant that Limbat was innocent; he did not steal the food. However, if Limbat came out earlier than the spear, so he was guilty. That strange rule made Limbat very sad. But he really wanted to prove that he was not guilty. So he directly jumped to the pond when Sigarlaki threw his spear. 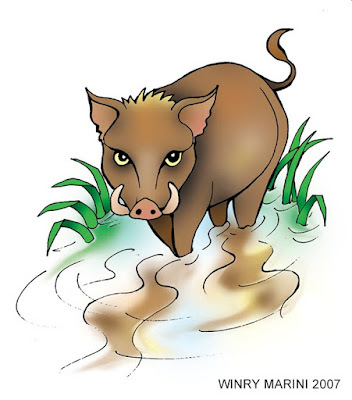 But, when the spear reached the bottom of the pond, Sigarlaki saw a wild pig near the pond. He immediately jumped to the pond and took his spear. Just before Sigarlaki was ready to throw his spear, the pig was gone. That automatically made Limbat innocent. The spear came out earlier than he was. Sigarlaki did not want to admit that. So he asked for the second chance. Just before he was ready to throw his spear, suddenly a big crab bit him. "Ouch! That's hurts!" Sigarlaki was screaming in pain.